We’re half-way through October, so everyone’s on guard for their favourite gaming communities to throw a sheet over their head and start shrieking “BOO!” very soon. Whilst many games have already geared up their Halloween events already, League of Legends is taking a different approach. To win the big prize this year, you’ll need to be handy with a real knife, rather than your Q key. Yup, this year Riot are handing out massive RP prizes to summoners who can carve the best LoL-themed pumpkin. If you’ve been struggling in the lanes recently but know your vegetable art skills are in tip-top condition, this is the perfect time to try and cash in. The prizes are pretty solid: the ten winners – chosen by the community – will take away 10,000 RP each to spend in League of Legend’s store on whatever takes their fancy, be that skins or champions. 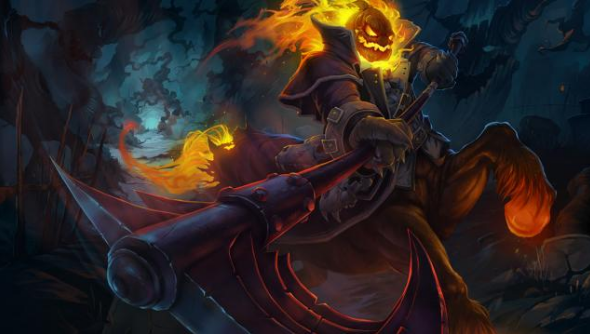 A further 5 pumpkins will get an ‘honorable mention’ by Riot staff, and bag 6,000 RP each. And then a final 20 submissions, randomly selected, will receive 2,000 RP. Nothing to grumble at. So how does one win? Just carve an incredible League of Legends-themed pumpkin, light a candle inside, take a photo, and send it here. You’ve got until All Hallows Eve itself to submit, but make sure your masterpiece is in by 11:59 PDT.